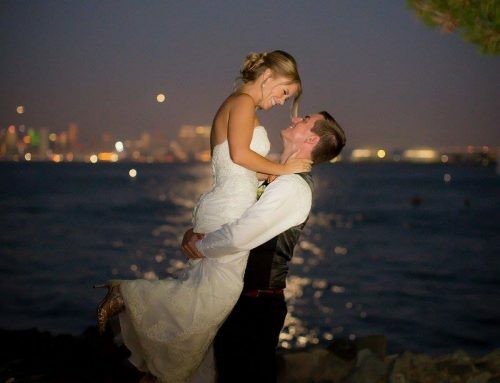 Allison and Aaron were our very first wedding couple in 2014! 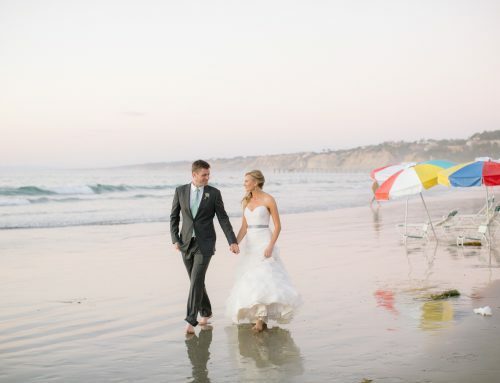 And of course, we began with a bang by beginning the year with a wonderful Scripps Seaside Forum wedding. The forecast called for rain…lots of it. We even had to hold the wedding rehearsal inside the day prior, and I prepped the couple that we’d likely need to move to our plan B. Allison and Aaron are such a warm and loving couple. While they were understandingly disappointed, they decided they wouldn’t let it ruin their day no matter what. So, they went about their evening, attended their rehearsal dinner and awoke to Mother Nature who couldn’t seem to make her mind up about what she wanted to do. It ended up being absolutely gorgeous, and we had a beautiful sunset–thank goodness. Their ceremony was so meaningful and touching, as it was officiated by their pastor. Allison and Aaron are very active at their church, and they also met there! Allison and Aaron are so fun-loving and warm, and it can definitely be seen in their wedding photos. The absolute highlight of the evening was definitely their first dance. For weeks, they were very secretive about their first dance. But, I knew it was going to be really special and unique, and it was! This is absolutely a couple that can be silly and have fun together–I loved it! Allison and Aaron, thank you for being such a pleasure to work with and putting your trust in me! I hope you continue to dance together forever!